Many clients struggle with print management and can end up paying over the odds for their printed materials. As a design agency, Frost Creative doesn’t print for you but we manage print projects on a regular basis and our team of experts is able to work with our clients to produce the best possible product in the most cost effective way. 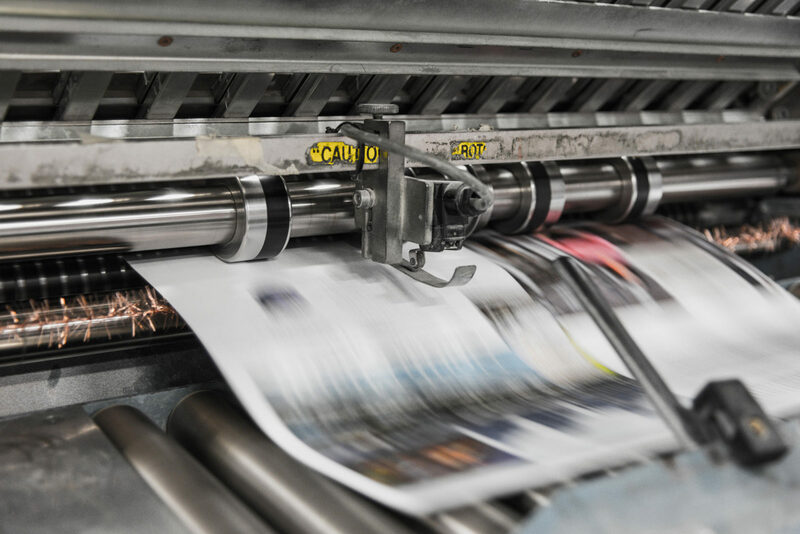 We are able to work with a variety of trusted suppliers to get the best deal for all of our clients and will happily use a number of suppliers for the same print project – one for the paper, one for the printing for example – to get the best possible price. Clients often don’t have the time to go through this type of supplier assessment process so end up using one supplier for the whole project and just going back to them again and again without assessing the cost. Frost Creative works hard to make sure the cost, as well as the product, is perfect. Print is complex for any type of job and each thing you want to print will impact on the overall price, so our team works hard to get the best value for your budget. Members of our team come from a traditional design and print background and understand print inside out. We know which issues and techniques and design features will impact on the cost of a job, so can advise accordingly. We also work with clients to come up with samples and options to show the differences between paper types and print finishes. Many clients don’t understand the key basic to printing which is that whatever you are printing, the more you print, the cheaper the cost per unit will be. It is always cheaper to print in bulk than to print smaller numbers. However, the type of printing you go for also depends on the number of unit items you require. If you want a short run product then digital printing will be the most cost effective option but you might need to compromise on the quality. However digital printing generally won’t go beyond A3 size on the press. Lithographic printing offers far more flexibility when it comes to the size of the document and types of paper stock you can print on, however it will only be cost effective if you have a large print run. In general, 250 will be the minimum print run but often the difference between printing 500 or 1000 units will be minimal so you should always check the unit cost. It will also be cheaper if your print job is a standard, generic size, like A4 or a business card. This is because the printers will bulk print with other items the same size, reducing their own costs. Therefore printing an A4 brochure will be cheaper than printing one that is an unusual size. Another minefield when it comes to printing is choosing the paper that you want to use and it can make a huge difference to the print cost. Many clients want premium quality paper for brochures for their customers, however different brands have different prices so we will always shop around to get the best deal. Paper choices include embossed paper, glossy, matt, coated, silk, coloured, textured, scented and uncoated to name but a few and it can become very confusing if you don’t have a print background to understand the difference. The thickness of the paper also varies as much as the stock. If you go for paper from the top name brands like GF Smith, Fedrigoni or Conqueror you will get a high quality finish for your printed materials but will pay a premium price for the privilege. However, if you look at less renowned paper suppliers like EBB, Antalis or Premier you can achieve a more cost effective option. The team at Frost Creative is on hand to advise on the most appropriate paper brand and type to use, both to reflect your brand strategy accurately and to meet your budget needs. We can also supply multiple samples for you to review before choosing. We worked with a client to help them reduce print costs, whilst retaining a premium and luxurious feel to their brochure, by adopting a premium grade stock for the cover and cheaper stock for the insides. This, combined with an appropriate binding, saw an end result that was a high quality, cost effective product. Once you have chosen the amount of units you require and the type of paper stock you would like, there are still a number of other decisions to make, which is why life can be made a lot easier by handing over print management to experts like the team at Frost Creative. For example, there are a choice of finishes you can choose including gloss, matt, silk or UV, as well as whether or not you want the cover laminated – and if so, which laminate style you require. There are options for having embossing or debossing, foil stamping, edge painting, letter press, die cutting… hopefully you are getting the picture now? The more add-ons you include in your print run, the higher the price will be – a bit like adding in all the extra gadgets when you buy a new car. And with a printed product, which has multiple pages, that also applies to the choice of binding. When choosing binding types it generally comes down to what works practically for the right number of pages, rather than what the binding looks like. But as with paper the higher the binding quality, the higher the cost. The most straight forward and cost effective option is a saddle stitch, which is simply two staples that holds all the pages together. However when you have a large page count (in excess of 24 pages) then saddle stitch may not be the best approach, especially if your paper type is thick. There are all kinds of other binding options available, including sewn bound binding, tape bound binding, hardcover binding, spiral bound or wire-o bound but for a quality finish with 24 pages perfect binding will be a better option. This is where all the pages are glued to a spine on the cover but comes in at a higher cost. If your print job requires extra finishing or die-cutting to a specific shape, such as a folder with a pocket, or point of sale material such as shelf wobblers or a die cut business card, you may be asked to supply the printer with a cutter guide. A job that requires die cutting will increase the time required and therefore potentially also increase the cost of your project because a die takes time to produce. If you want your item to be bespoke, be prepared to pay more for it and for the job to take longer. However, at Frost Creative we like to make life easier for our customers. We have developed a range of cutter guides over the years for a variety of products including folders, cards, swing tags, packaging, shelf wobblers and many other items. By designing your artwork to fit within an existing cutter guide we will save you both valuable time and money. We support our clients through the entire creative design process and we include print within that. The last thing we want is great work being let down by poor print. We are fully aware of budget constraints but if you can source the right print partners then you’ll be surprised at what can be produced within your budget. This is where we can really be of value. When it comes to print management, we know that there are so many variables, it can become a minefield for clients and you may be tempted to just to stick with the one print supplier to make life easier. However, with all those variables come a lot of opportunities to save money without scrimping on quality. Our team at Frost Creative can navigate the minefield for you and always find the best and most cost-effective solution, saving you time and money; leaving you to focus on more important things.